The Netherlands might be 9 times smaller than Germany, but it punches way above its weight in Europe’s international education arena, as just highlighted by the Times Higher Education's Europe University Rankings 2017. After the UK, the Netherlands has the highest percentage of international students and staff in Europe. 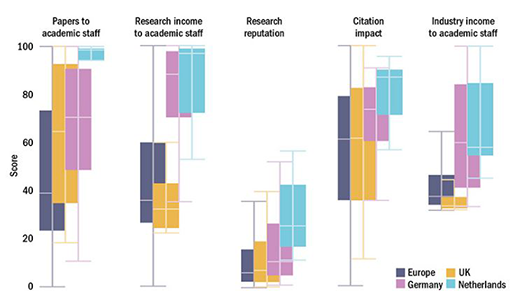 Equally important, it occupies the top spot when it comes to research reputation, research productivity (papers to academic staff), industry income to academic staff, citation impact and research income to academic staff. Though the sheer number of foreign students in Germany is more than three times those in Holland, the percentage of international students in the Netherlands is estimated at 18% of all university students, while in Germany it is believed to be between 10 – 12%. Furthermore, Holland still reigns supreme in continental Europe when it comes to the number of English-taught programmes. Last year a survey by Dutch newspaper De Volkskrant found that more than half (60%) of university programmes in Holland are now taught entirely in English. The newspaper looked at 1,632 programmes at 13 universities in the Netherlands. In less than 30% of the almost 1,200 master's degree programmes the language is in Dutch. The rest are all in English. More than half of all master's students last year did their degrees in English, a study by VSNU showed. With bachelor's degree students, it was about a fifth of all students. In contrast, universities in Germany continue to offer the majority of their degrees in German. Experts who spoke to THE said while some countries focus on attracting degree-seeking international students, Germany places a lot of emphasis on hosting overseas students on short-term programmes. Interestingly enough, while education powerhouses in Europe, like the UK, France and Germany, get the largest share of their foreign students from China, in the Netherlands the biggest source of international students is Germany.